CELTIC EXODUS - THE FAMINE STORY is a musical equivalent of Les Miserable, which records the events of the Famine through songs, dialogue and fully scored music. 1997 saw the 150th anniversary of the Famine Black 47, and the album was released as a commemorative work. 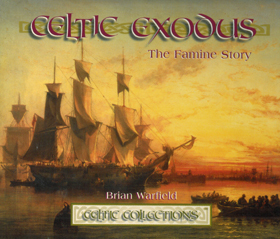 CELTIC EXODUS - THE FAMINE STORY, is a moving album that tells the tragic tale of time. Uileann Pipes, Box Accordions, Whistles, Bodhráns all merge with orchestra to form an emotive story-telling within a musical framework. CELTIC EXODUS - THE FAMINE STORY begins with the musical theme Black 47, where tragedy is encapsulated in haunting melody. Musical themes progress chronologically through the principal events of the Famine, which include Workhouses, Blessings, Exodus, Ships At Sea and climaxes in a celebratory spirit in Thank Cod For America. CELTIC EXODUS marks and pays tribute to one of the most important episodes in Ireland's history. It is as important as a social and historical chronicle as it is a gripping musical masterpiece.